Ufuk Önen is a music producer, composer, audio recording engineer, consultant, filmmaker and educator. He has produced and recorded more than 50 albums, EPs and singles in Turkey, his native country, and has worked as a composer, engineer and sound designer on more than 200 Turkish, European and North American audio-visual projects. His work has appeared in international films festivals, and he has recorded and toured with Hazy Hill between 1988-2000. Known for his tenacity, drive and passion for delivering exceptional work, Ufuk has become a trusted partner and consultant, contributing to numerous audio, sound reinforcement and cinema sound installation projects. 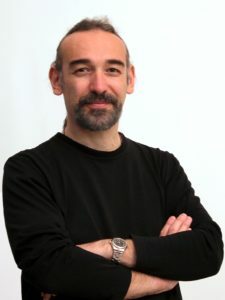 Ufuk is also the author of Audio Recording and Music Technologies (English title), the first reference book in the Turkish language covering the fields of audio recording and music technology (now in its ninth printing). Today, this book is standard required reading used in universities and schools throughout the country. A prolific writer with a love for sharing his passion with others, he has published three other books and more than 40 articles and 150 blog posts. Ufuk is the co-founder of Audio Technologies for Music and Media (ATMM), a trilogy of international conferences dedicated to audio and music technologies. The conferences took place at Bilkent University, Ankara, Turkey, in 2012, 2013 and 2014. First of its kind in Turkey, ATMM brought together professionals, academics and practitioners and students, coming from eleven different countries. Ufuk holds B.A. in Linguistics and M.A. in Communication and Design. He is a graduate of Los Angeles Recording School and has a PhD from The University of Salford, United Kingdom. Ufuk teaches “Sound Design“, “Music and Media“, “Visual Communication Project” and “Digital Video Production” courses in the Department of Communication and Design (COMD) at Bilkent University, Ankara, Turkey. Ufuk is a member of AES (Audio Engineering Society) and IASIG (Interactive Audio Special Ineterst Group, supervised by MIDI Association). He is the AES Vice President for Southern Europe, Middle East and Africa region for the 2017-2019 term. Ufuk is an Ambassador for Waves Audio Community. Among other projects, recent works of Ufuk includes a new book on mixing techniques in music productions, and a feature-length documentary, titled Black, Not Gray: Ankara Rocks!